Prozac is now formally available for depressed children. Psychiatrists have prescribed the world's best-known antidepressant, and similar competitors, to their youngest patients for years, despite a shortage of studies proving they work in children. But the Food and Drug Administration declared Friday that there's finally proof that Prozac alleviates depression in children 8 years and older, the first drug among the newer antidepressants, which boost the mood regulator serotonin, to win such approval. Prozac's Indianapolis-based maker, Eli Lilly & Co., said it didn't intend to market Prozac for children. Still, putting child-specific information on Prozac's FDA-mandated label means more doctors, not just depression specialists, may prescribe it. The FDA also approved Prozac's use in children with obsessive-compulsive disorder, the third serotonin-enhancing drug to win that designation. Prozac side effects are similar for adults and children, including nausea, tiredness, nervousness, dizziness and difficulty concentrating, the FDA said. But children have one unique side effect: In one study, children and teenagers taking Prozac grew a little more slowly - a half inch less in height and 2 pounds less in weight over a period of 19 weeks - than similarly aged children taking a dummy pill. 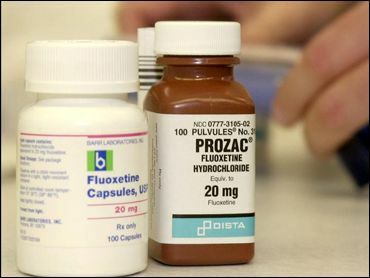 No one yet knows if the Prozac patients catch up or how big a concern that is, said the FDA's Dr. Russell Katz. Lilly agreed to further study the side effect. Up to 25 percent of U.S. children and 8 percent of teenagers suffer depression, the FDA said. Additionally, about 2 percent of the population has obsessive-compulsive disorder, and at least a third of those cases began in childhood. Psychiatrists welcomed the FDA's move. "It made sense to prescribe these drugs, but yet everyone who did it felt a certain amount of anxiety that we didn't have all the data," said Dr. Lois Flaherty of the American Psychiatric Association. Manufacturers have little incentive to study adult drugs in children if they expect desperate pediatricians will use the medicines anyway. In 1998, the FDA tried to require more pediatric testing, but a federal court recently threw out that requirement.